ellie Apr 12 2019 9:55 pm OMG! What dead stares he can give in Fugitive Boys! lulu Sep 04 2018 12:11 am He's one of my favorite japanese actors in this industry, i really love his acting skills after I watch his indie movie Tadaima. Wish all the best macken more projects to come. God Bless! Chingu Apr 19 2018 8:02 pm He deserves to be main lead. He's perfect!! haha Feb 26 2018 8:39 am @Jeo he just changed his stage name to Mackenyu Arata last year, inspired by his character in Chihayafuru. Jeo Feb 26 2018 5:47 am Wait a minute. 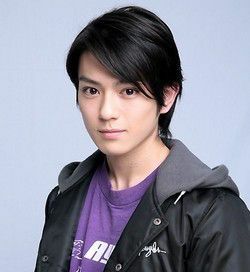 I thought his name is Mackenyu Maeda, not Mackenyu Arata. I think there has been some confusion with his character in Chihayafuru. BabyMeo Jan 23 2018 10:16 pm He has joined Pacific Rim 2 Uprising, showing on theater in Mar 2018. He is really cute and appears until the end of the movie <3 Wait to see him. fantasialive Jan 22 2018 2:13 am just watching 'bokutachi ga yarimashita' and he's so handsome bad boy.. i thought he's member of boyband, but when i saw his profile OMG, he's so young. well he's next superstar. star mijung Dec 27 2017 9:59 pm Omg ㅠㅠ He's so handsome OMG. He's giving me first love vibe ㅠㅠ Ah ~ I'll support him a lot for sure ?? mya Dec 10 2017 2:22 am uhhh i don't understand. why is his rating so low?! 76?!?!?!? Erna Choi Nov 29 2017 11:20 pm He is so handsome. My heart!!!!? V Aug 08 2017 1:06 am Huge fan of this guy ever since. Not only was he blessed with the good looks, but he's also versatile as an actor. The variety in his roles - from a cute high school guy (Chihayafuru, Peach Girl, Let's Go Jets) to a bad boy (Aogeba Totoshi, Bokutachi ga Yarimashita) to a weird villain (Jojo) - just proves he can play anything. His fluency in English, his skills in karate and his talent in music give him the advantage! Can't wait to see you in more movies and dramas in the future, especially Pacific Rim 2!!! I'll keep supporting you. Do your best, go Macken!!! Gero Aug 07 2017 9:25 am All these 'he looks like this or that' comments... Can't you guys appreciate an actor without comparing him to other people? And not even comparing technique-wise with fellow actors, no less. He's a talented guy, and he still has much to improve, and I appreciate his versatility character-wise. Ioneha May 01 2017 2:58 pm Considering all that he has been through,I hope for nothing but the best. He's a good person. Erna Choi Mar 04 2017 7:49 am Like NCT's Taeyong,seriously I love him in first sight?? yuki Nov 11 2016 2:58 am he looks like kim jae joong!! kiki Oct 15 2016 11:09 pm keep your head high... don't sulk. I'll still support you no matter what! Jam Jun 29 2016 4:48 am I'm glad he's getting some projects lately. I hope he'll get the break to be a lead or have a project set just for him, someday. Please add his TV series from WOWOW "I'll fall in love with you again tomorrow." He got quite a mature role but he totally nailed it! jjjjjj Apr 27 2016 7:27 am he's such a handsome actor. but what's with the low rating? Danni Apr 16 2016 5:57 am Saw him first on Kamen Rider then in To Give a Dream. Christine Dec 01 2015 6:09 am Please give him more projects 'cos he's got the potential!